Lillet & Trey (America Hates Us! 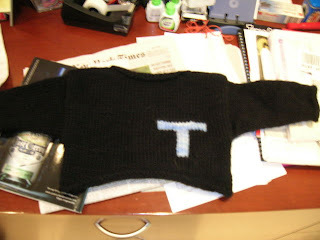 ): Putting The "T" In "Intarsia"
Putting The "T" In "Intarsia"
Completed baby sweater for my friend's son! I am glad he was named Townes and not Quentin. I love that sweater! I want to make one for my baby. Do you have a pattern? Hi E!! I am so flattered you like this as you were the epistolary friend of Marc J! It is the Debbie Bliss boatneck sweater from Baby Knits for Beginners, in Malabrigo worsted in black, and the intarsia part I just kind of did it. I did the letter on graph paper with X's first, and then as I knit realised that the trunk of the "T" would have to be a bit taller and in retrospect I should have made the crossbar of the "T" one row thicker. I would experiement with a swatch of just the letterblock first, and then go ahead and do the sweater. Does that help? If you like i can mail you something more detailed! alas, he never considered us friends. thanks for the knitting tip. america may hate you but I LOVE YOU.